Hello ladies! It's no secret to anyone that T-shirts are fashion basics that can be worn with completely anything you want, starting from shorts, jeans, jumpsuits to skirts and even dresses. The same T-shirt can look cool and laid-back with a pair of cut-offs, or it can look smart-casual worn under structured blazer teamed with slim jeans or short skirt. It's no wonder why bloggers are going crazy about this simple garment. The key is all in the styling, it's up to your personal prerogatives. The following collection comes with stunning Polyvore fashion sets you all can recreate this Summer 2018. I think we should take a look at some of my favorite looks. Let me know what you think in the comments below. A classic white T-shirt can be worn with classic light blue high-waisted denim shorts. The outfit is completed thanks to rounded white sunglasses, criss-cross beige sandals and silver metallic jewelry. I remember one day I stole my boyfriend's tee and you know what, I really loved the fit of this top. It was relaxed and comfy. I thought to myself, why can't I incorporate it with my everyday clothes. Today I bring you my favorite ways to make your boyfriend T-shirt look chic and glamour. In this collection are showcased pretty 1990's oversized band tees, plain color basics, and other effortless and relaxed essentials. You might ask me, but this boxy top looks really baggy, how and with what can you style it? The 'borrowed' clothes from men's wardrobe are ideal to wear with anything you want. The best PLUS of these tops is the flattering fit what ideally suits petites, normal bodies and plus-sized ladies. There are several tips and tricks how you can rock an oversized T-shirt in the streets and parties. If you are searching for a simple outfit inspiration, then I am here to share with you best ways how to wear a T-shirt. There are thousands of awesome plain color, printed and graphic t-shirts around. We see glamour street style stars, designer collections and even celebrities appearing on the red carpets in cool T-shirts. How about white tee with Star Wars print? Team it with your favorite jeans. It feels like we are still in love with oversized garments. 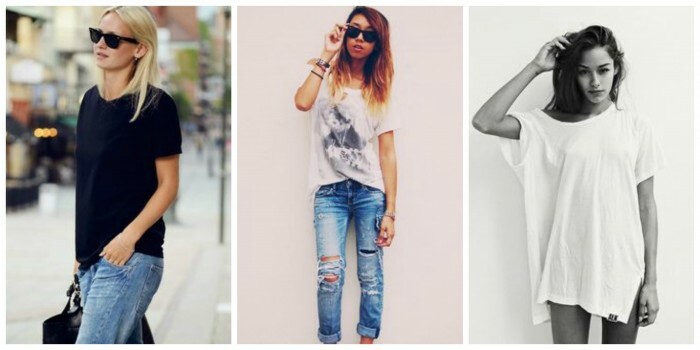 In today's post I want to draw your attention to this topic, called how to wear and how to combine oversized T-shirts. I am going to share with you 37 outfit ideas that feature this awesome exaggerated top. Jersey tops with athletic and sports inspired prints look awesome styled with your favorite skinnies and cropped cover-ups. Keep the print vintage and wear this dark blue tee as a dress styled with your trainers and white socks.